As I was getting ready for school today, I noticed the M 6.2 notification from the USGS Earthquake Notification Service. People can sign up for the USGS ENS so that they can get emails when the USGS broadcasts this information. Most all apps that people install on their devices use the USGS feed as a basis for the sources for those apps. So, it is rather ironic when people make claims that they use these apps because they don’t trust the USGS. When I read statements like that, I just roll my eyes. People love ways to promote their conspiratorial views of the world. Here is the USGS ENS web page. 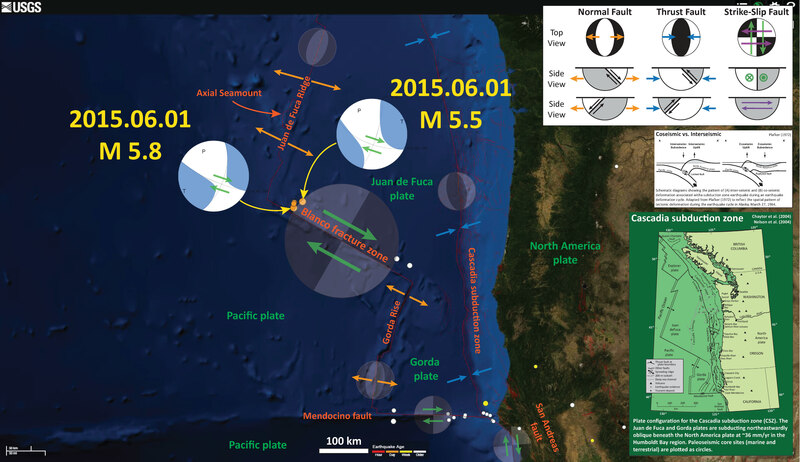 The most recent earthquake on the Blanco fracture zone was less than a month ago. Here is my report on that earthquake. 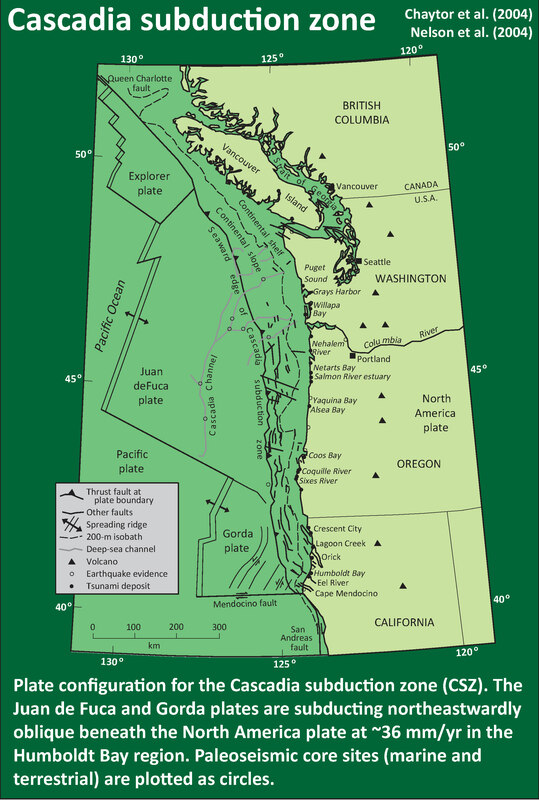 The BFZ is a transform plate boundary that connects the Juan de Fuca ridge with the Gorda rise spreading centers. 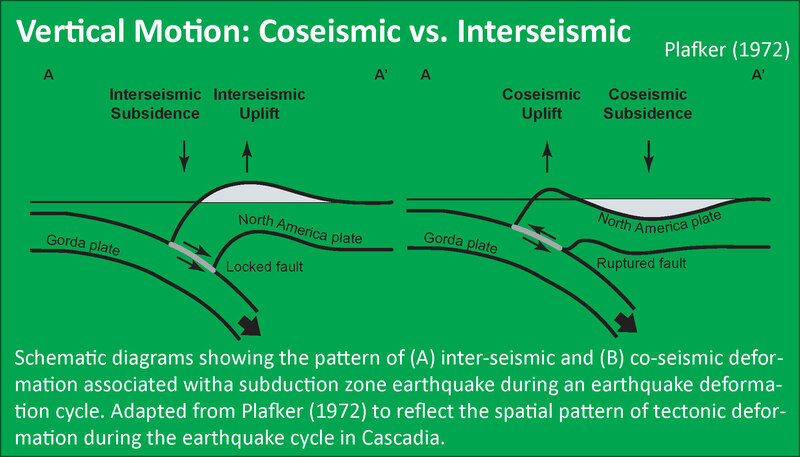 As for all individual earthquakes along the BFZ, there are no direct implications for earthquake or tsunami hazards along the Cascadia subduction zone (CSZ) as a result of these BFZ earthquakes. 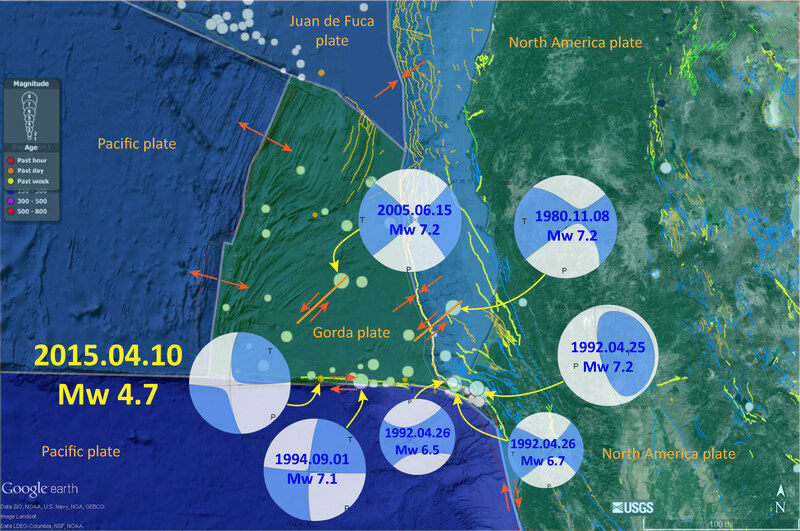 Even though people felt this M 6.2 along the coast of Oregon, as well as in the Willamette Valley and Portland, the earthquake is just too far away from the CSZ to change the static stresses within the CSZ megathrust fault, or within the North America, Juan de Fuca, or Gorda plates. 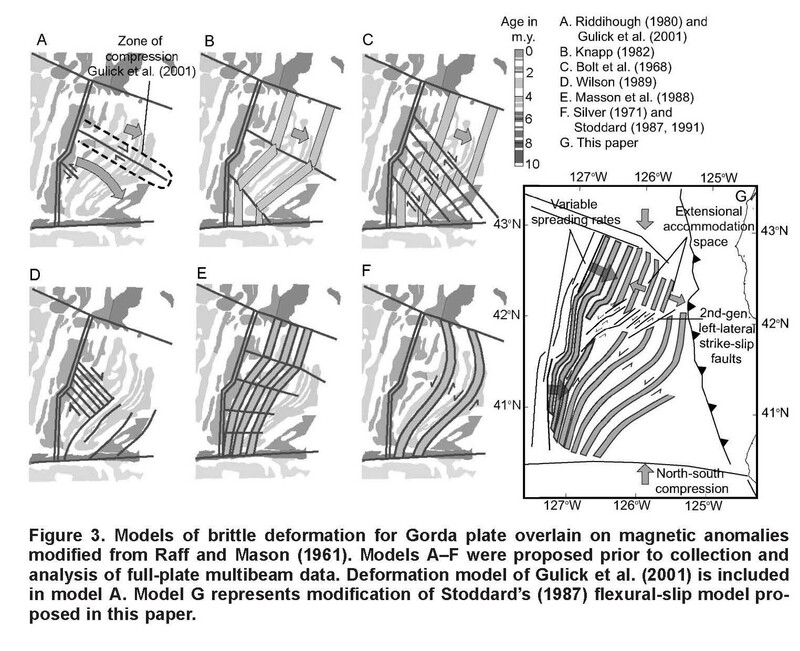 In the upper left corner is a map showing the details for the faulting along the BFZ (Braunmiller and Nabelek (2008). 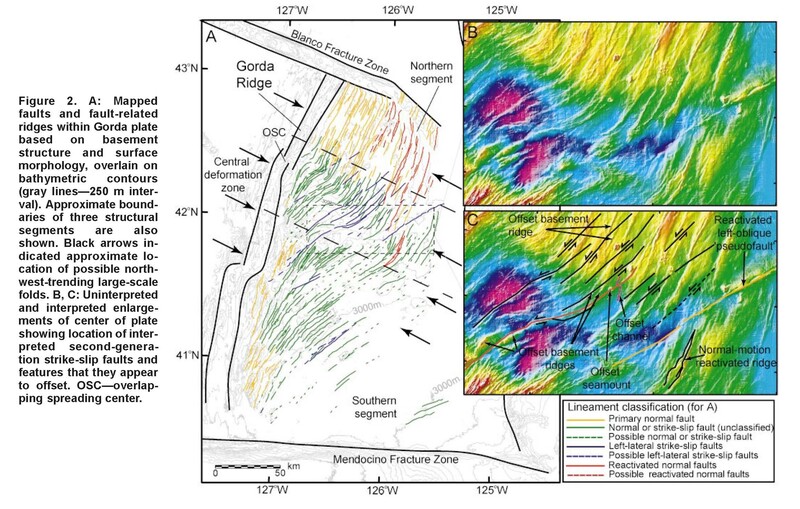 Note that this zone is quite complicated and includes several normal fault bounded pull-apart basins. 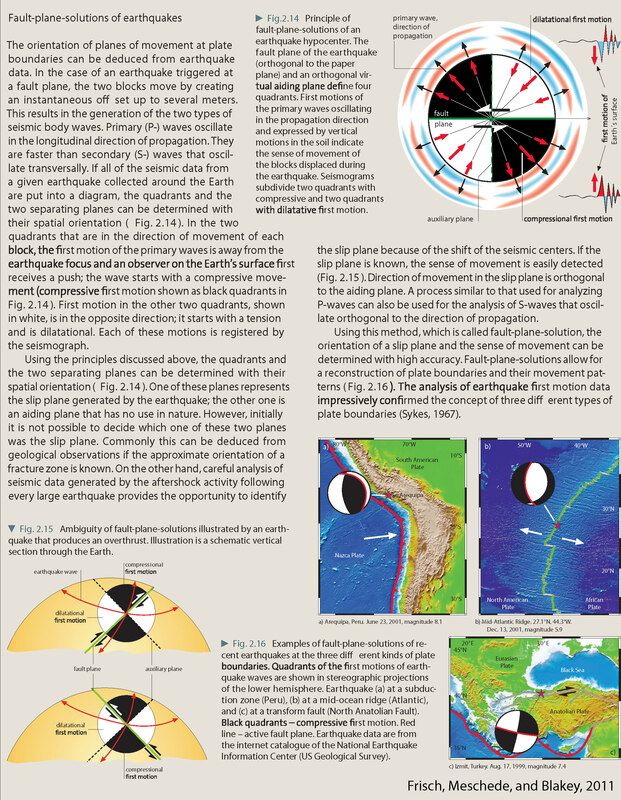 I include two main interpretive posters for this earthquake. 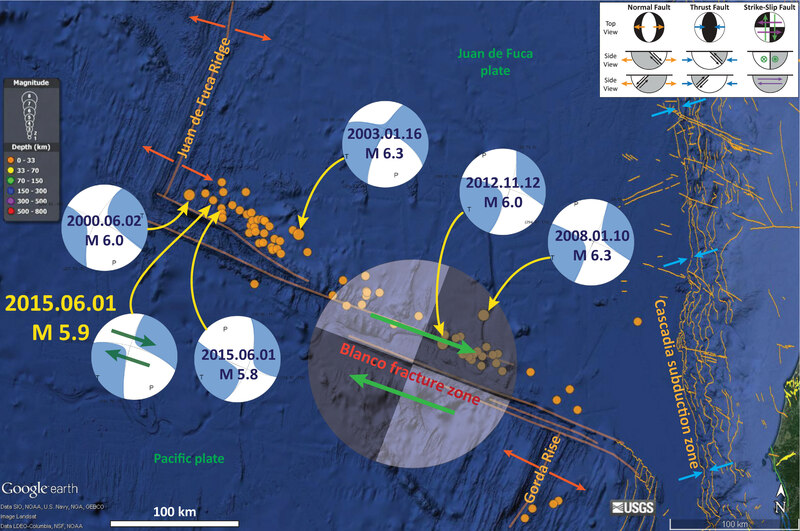 One includes information from this earthquake, including the MMI contours and USGS “Did You Feel It?” colored polygons. This way we can compare the modeled estimate of intensity (MMI contours) and the reports from real people (DYFI data). There are some good matches and some mismatches (in western Oregon). Check this out and try to think about why there may be mismatches. 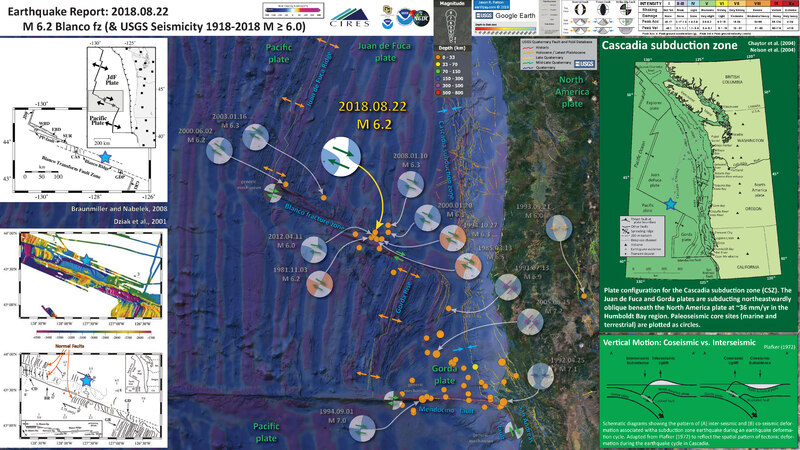 The second poster includes earthquake information for earthquakes with M ≥ 6.0. I place fault mechanisms for all existing USGS mechanisms from the Blanco fracture zone and I include some examples from the rest of the region. 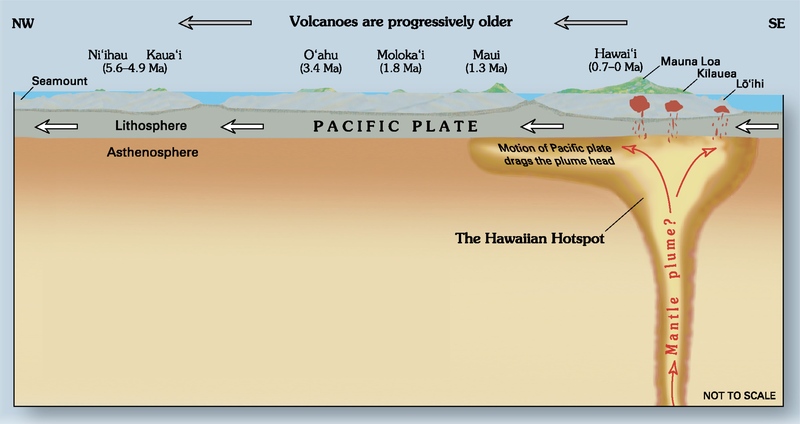 These other mechanisms show how different areas have different tectonic regimes. 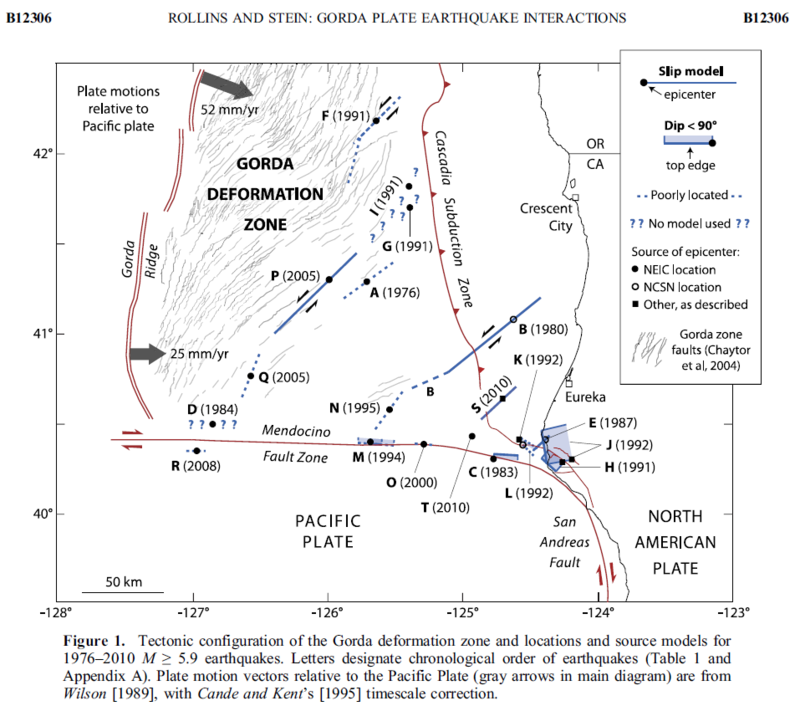 Earthquakes within the Gorda plate are largely responding to being deformed in a tectonic die between the surrounding stronger plates (northeast striking (oriented) left-lateral strike-slip earthquakes). I include one earthquake along the Mendocino fracture zone, a right-lateral (dextral) strike-slip earthquake from 1994. 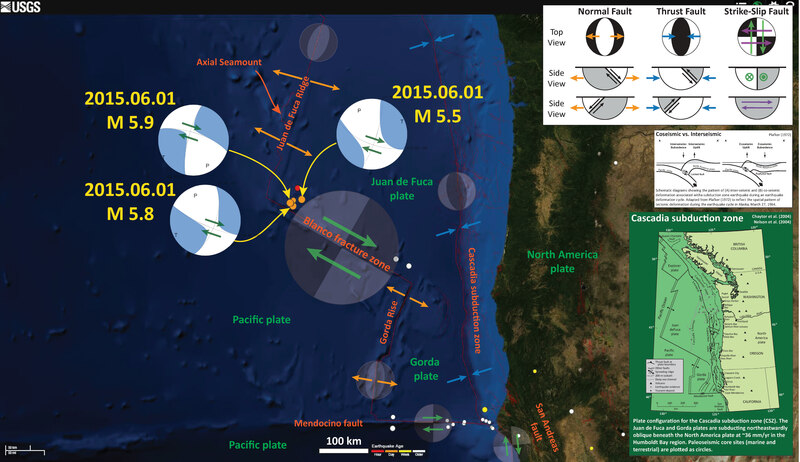 I include one of the more memorable thrust earthquakes, the 1992 Cape Mendocino earthquake. 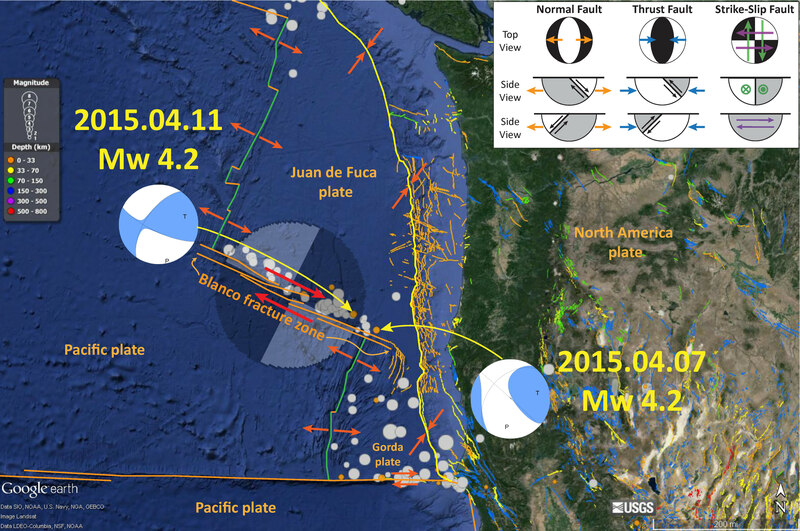 I also include an extensional earthquake from central Oregon that may represent extension (basin and range?) in the northwestern region of the basin and range.